The House of Opulence collection showcases limited editions of scented candles and reed diffusers that effortlessly coordinate to create a beautifully dressed and perfumed interior. Mix and match our scented candles with the aroma reed diffusers of your liking, depending on your mood and the personal scent signature that you would like to give to your interior. Every year, THE HOUSE OF OPULENCE creates a limited edition of scented candles in close cooperation with an artist that we love. 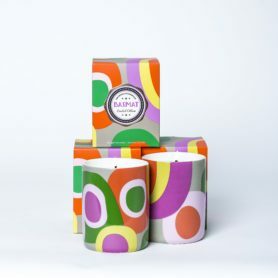 This year, we are proud to feature the artwork of Basmat Levin with our BASMAT candle collection. Please continue reading below as well as in our INSPIRATION section for more information about these unique candles, of which only a few hundred were created with lots of love & dedication. BASMAT BLACK surrounds you with an opulent oriental, smoky and mystical perfume that opens with zesty bergamot and oregano, followed by the aromatic notes of amber, frankincense, myrrh and cistus. The final touch with warmth and depth is given by patchouli, agarwood smoke, cardamom, leather, sandalwood and a wonderful quality of ylang ylang. Just like our other candles, this candle is made with 100% botanical wax and has an average burning time of 55-60 hours. Every year, THE HOUSE OF OPULENCE creates a limited edition of scented candles in close cooperation with an artist that we love. 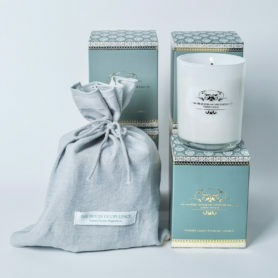 This year, we are proud to feature the artwork of Basmat Levin with our BASMAT candle collection. Please continue reading below as well as in our INSPIRATION section for more information about these unique candles, of which only a few hundred were created with lots of love & dedication. The BASMAT GOLD scented candle is infused with a warm, feminine and sensual perfume with notes of bergamot, rose, lavender, amber, sandalwood tonka bean, vanilla, patchouli, nutmeg and leather. Just like our other candles, this candle is made with 100% botanical wax and has an average burning time of 55-60 hours. 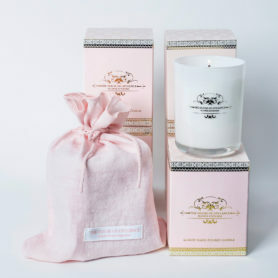 Created with lots of love by The House of Opulence's founder Amiek for her precious daughter Frederique, who was born in Shanghai and given the Chinese name Fei Fei 菲菲 which means luxuriant and rich with fragrance. This candle's perfume is made with the delightful accords of Bergamot, Rose, Patchouli and White Musk. Read more about this unique candle on our INSPIRATION page. 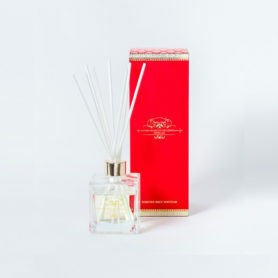 The carefully created fragrance blends of our reed diffusers subtly perfume each interior for an average of 5 months, ensuring your interior remains scented with the fragrance you love. The timeless combination of Frankincense & Myrrh delivers a sense of ultimate peace and tranquility. Base notes of this scent are musk, sandalwood and cedar, giving an added touch of depth and oriental mystery. Both this reed diffuser and its matching candle come with a special golden touch. We created this special gold edition as a tribute to the Three Kings who knew all about precious fragrances. Our carefully created aroma blends can subtly perfume your interior for at least seven months, ensuring your home remains scented with the fragrance you love. A relaxing and sensual scent with notes from French lavender, eucalyptus, rosewood, anise and a base of vanilla Bourbon and Tonka bean. Our reed diffusers are made with pure essential oils, which we handpicked from all over the world. Each of the ingredients is blended with skill, precision and love. The natural rattan sticks allows the fragrance to travel up the reed and envelope the room with a subtle perfume. Our carefully created fragrance blends can subtly perfume your interior for at least seven months, ensuring your home remains scented with the fragrance you love. An uplifting and reviving scent with notes from ginger flower, lily, violet, rosewood, lilac and a woody base. Our reed diffusers are made with pure essential oils, which we handpicked from all over the world. Each of the ingredients is blended with skill, precision and love. The natural rattan sticks allows the fragrance to travel up the reed and envelope the room with a subtle perfume. Our carefully created aroma blends can subtly perfume your interior for at least seven months, ensuring your home remains scented with the fragrance you love. Treat yourself or your beloved ones to one of our luxury gifts. We have a range of gift sets which come with a free gift box and card to personalise with your own message. 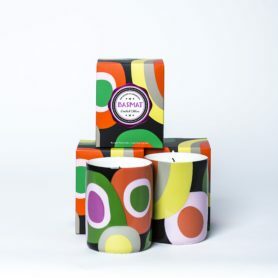 This giftpack contains a set of four candles of your choice (based on availability).